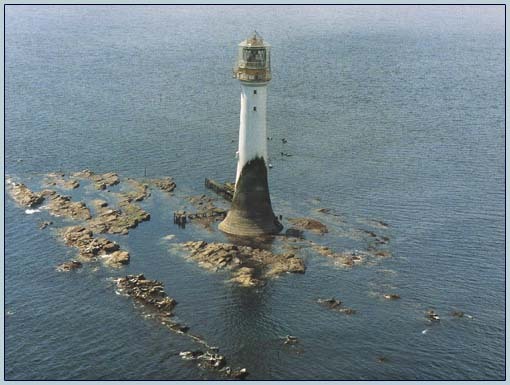 is now almost 11 years old, and is still going from strength to strength - especially now with the pending Bicentennial of the lighthouse due on the 1st February 2011. On retiral from the newspaper business back in 1999 and with time on my hands, this website was set up mainly to remember my ancestor, Capt. David Taylor, and the important part he played in the construction of the Bell Rock Lighthouse. During the following 4 years the website started to gain popularity mainly from lighthouse aficionados and those with maritime interests. In 2003 the BBC produced their series "Seven Wonders of the Industrial World" and in so doing catapaulted bellrock.org.uk onto the national scene. However, being involved in the production of the film from a factual point of view, I was unhappy in the way in which they "lampooned" John Rennie, but as each episode of the series was based on the contention between two men, Rennie in this instance came off worst! The film was then (and continues to be) a great success. On the night it was shown the statistics soared with a total of 3,996 within 24 hours - 18th September 2003. The film since then has been shown umpteen times on a variety of BBC channels. For a sample of early Guestbook entries - see Old Guestbook Archive. The BBC, however, did not stop there. They market their products, not only to English-speaking countries, but to the world at large. Language is no barrier. What you see below is a snapshot of hits over roughly a 10-day period - 500 hits in all - giving a fair idea of the distribution of its popularity worldwide. Below is the day when the South and Latin America were shown the programme. Resulting from that, a group of individuals from southern Brazil were so inspired that they decided to set up their own Bell Rock Pub in Porto Alegre, Brazil. Whether or not their venture is still on the go is doubtful. There has been no word from them for some time now and their website is no longer available.